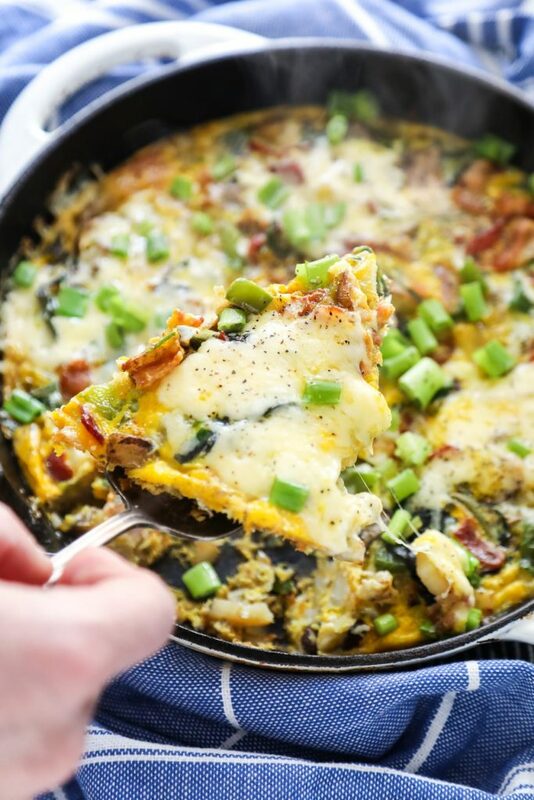 Ladies and Gents, meet the frittata of our food dreams! A frittata that packs a nutritional punch, and explodes with more flavor than one could ever imagine possible for a humble frittata. Is it possible to explode with flavor? Hmmm, let’s just go with it! This frittata isn’t very photogenic, but it’s not what’s on the outside that counts, right?! In order to truly get to know this not-so-photogenic frittata, you have to peek inside–past the cheesy surface. Friend, that’s where the good stuff is scattered. 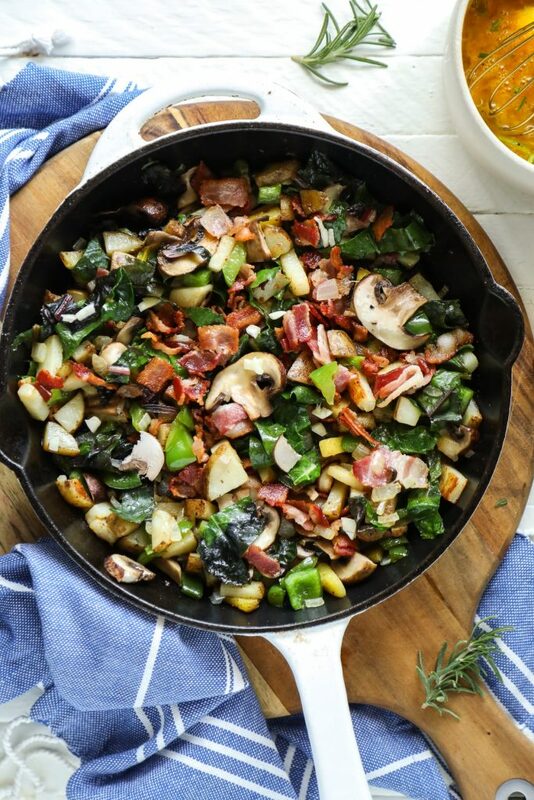 The really good stuff, like: bacon, mushrooms, peppers, potatoes, and leafy greens. 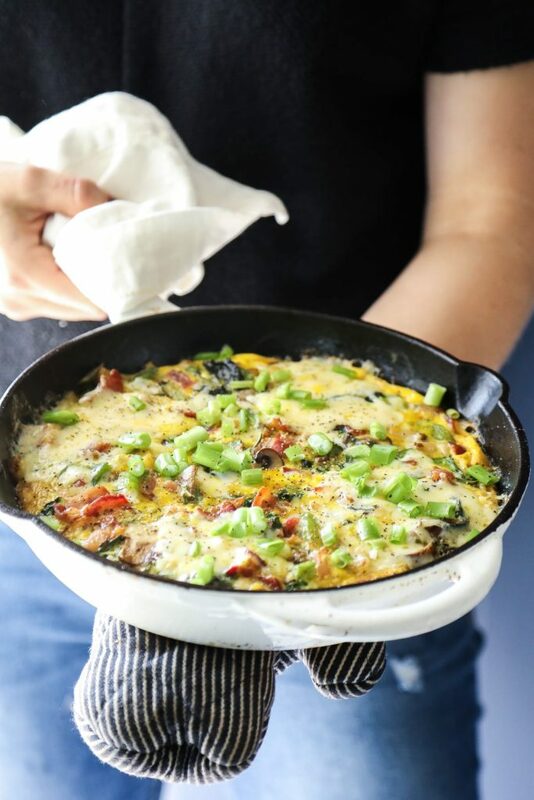 This is the first frittata recipe shared on Live Simply, which is kind of a shame since a frittata is such an easy and inexpensive way to create a hearty, real food meal. So right now, I’m promising you that today’s recipe won’t be the last. More frittatas to come! 1. The frittata starts on the stove-top and then finishes in the oven. 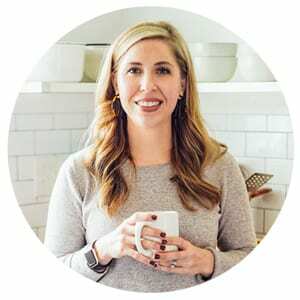 With fifteen minutes in the oven, there’s time to clean-up, set the table, or even fold a few pieces of laundry (maybe, maybe not). Or how about just sitting down to a glass of wine, or coffee–depending on the time of day. 2. A frittata embraces its hearty fillings rather than hiding them. I’ll admit, I struggle with getting the fillings perfectly tucked inside an omelet, and then flipping that omelet without losing any of those precious fillings. With a frittata, there’s no hiding or flipping. 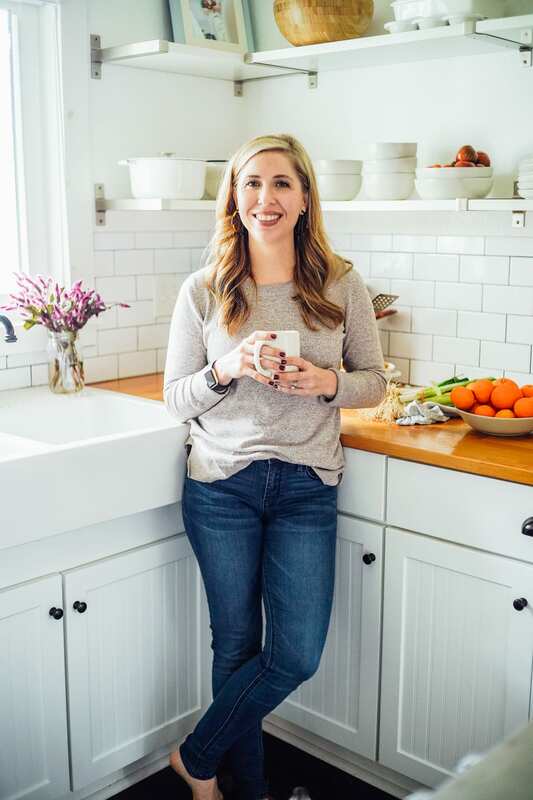 Just pour the eggs over the veggies and meat, and embrace the rustic look that comes from having fillings scattered everywhere–kind of like living in a home with two kids ;). Embrace it, Mom!<–I’m talking to myself here. Another way of looking at a frittata is as a bulked-down (again, is this a thing?) quiche. While I love a good quiche, there isn’t always time to make a pie crust, no matter how easy my recipe may be to pulse together. That, my friend, is when a frittata recipe comes in handy. A frittata is hearty like a quiche, just without the crust base, which means one less step and mess in the kitchen. Today’s frittata recipe makes for a veggie-packed breakfast, brunch, lunch, or dinner. Since the frittata is so incredibly filling, you don’t really need much else to accompany a slice. Of course, if you want to create more of a “meal,” then I suggest serving the frittata alongside homemade muffins (maybe make them in advance?) or toast, raw carrots and celery, or a simple salad. I’ve also been known to sandwich a slice of frittata between two slices of sourdough toast, sprouts, and mashed avocado. A frittata is a great meal to prepare on a Sunday afternoon, and then enjoy throughout the week as a homemade “fast food” option. It’s easy to eat good food on a busy morning when there’s something like a frittata tucked away in the fridge. 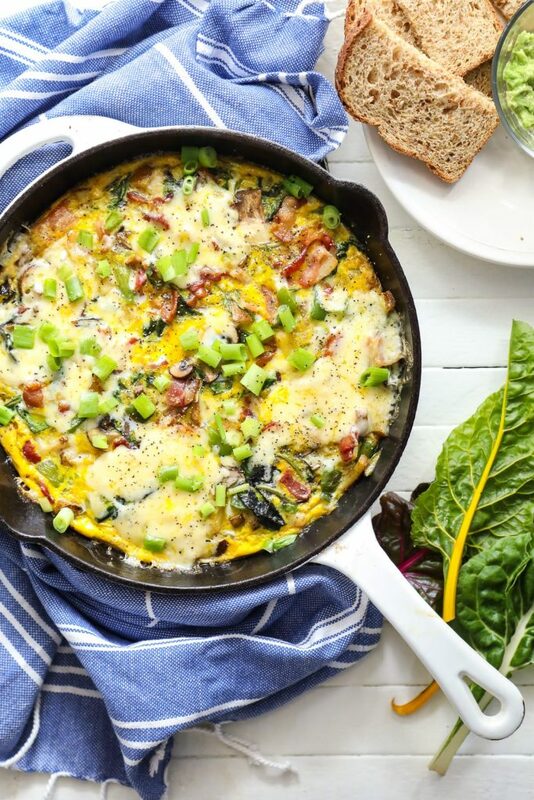 A hearty bacon, vegetable, and kale frittata. 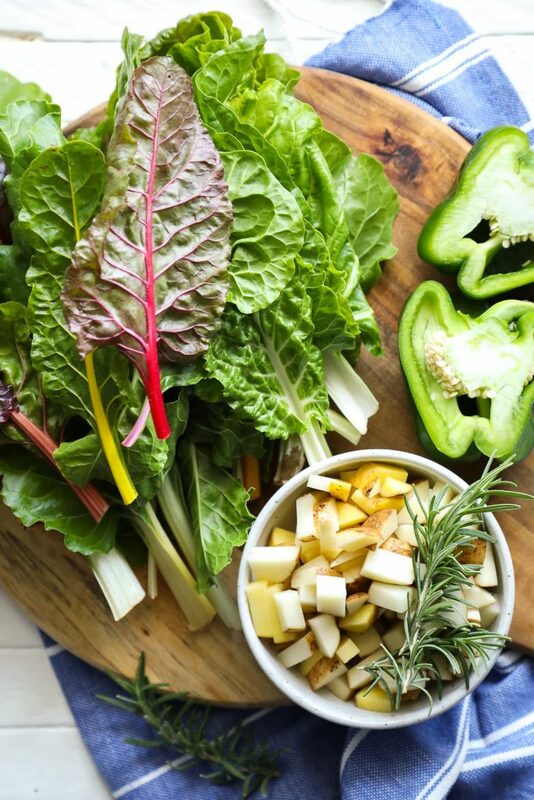 This nutrient-rich frittata may be served for breakfast, lunch, or dinner. Prep this frittata in advance for an easy "fast food" meal option. Whisk the eggs with 1/2 teaspoon salt, 1/4 teaspoon pepper, and 1 tablespoon chopped rosemary. Set aside. 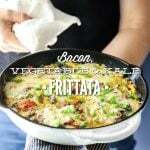 In a 10-inch cast iron skillet, cook the bacon over medium heat until crispy. Remove the bacon and set aside, leaving about 1 1/2 tablespoons of fat in the skillet (I had to drain half the fat--this will depend on your bacon). Add the diced potatoes and sprinkle with 1/2 teaspoon salt, then sauté until golden brown, about 3-4 minutes. Add the diced onion and sauté until the onion is translucent and the potatoes are just starting to become tender. 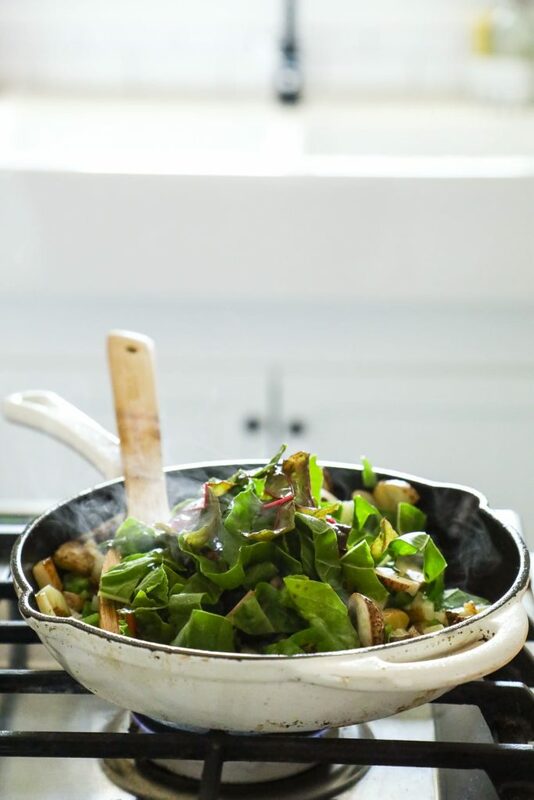 Drizzle the veggies with olive oil and add the garlic, then sauté for 1 minute. Stir in the bell peppers, mushrooms and kale, sauté until the kale is wilted and the peppers and mushrooms are starting to soften, about 3-4 minutes. Add the bacon back to the skillet, then pour in the whisked eggs, making sure the eggs spread evenly in the skillet. When the eggs look firm, remove the skillet from the oven and top the frittata with grated Parmesan and cheddar cheese. Switch the oven to broil and return the skillet to the oven. Broil, on low, until the cheese bubbles and browns slightly, about 2-3 minutes. Serve hot. Garnish the frittata with chopped green onions (optional). This looks so yummy! To make it vegetarian could I just skip the step with the bacon and add olive oil instead for the potatoes? Hey Birthe, I’m so glad the grams are helpful! I forgot to weigh the greens-sorry! Yes, you’ll just want to skip the bacon and use oil. So you’ll probably need about 2 or so tablespoons of oil to compensate for the lack of bacon grease. I made this for breakfast for my wife, super delicious and the leftovers the next day were great. That’s so great, Phil! I’m so glad you both enjoyed the frittata. Leftovers are the best :). I made this for my husband and myself with a few minor changes. I used broccoli florets instead of kale, whole red pepper and 2 cups sliced mushrooms. Excellent!! Just went to the store and plan to make it again this week. Because it just the two of us we do have breakfast ready to go. Great recipe. Thanks for all your hard work.